Magic Millions graduates had a day out across Australasia today with no fewer than eight individual stakes winners. 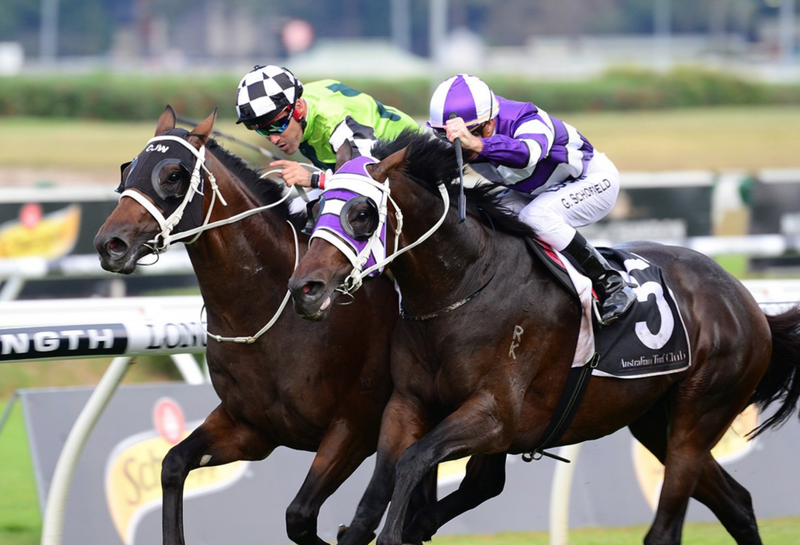 Higher Ground (pictured, purple and white) may not be a Winx but he looks a three-year-old with a very bright future following an impressive head bobbing win in today’s Group Three Frank Packer Plate (2000m) at Randwick. Purchased and raced by Winx’s part owner Debbie Kepitis, Higher Ground edged out stablemate and recent Group One performer Tangled in a performance that booked a trip north for the Group One Queensland Derby. Now the winner of four of his eight lifetime starts, Higher Ground is trained by Chris Waller and was ridden to his maiden group win this afternoon by Glyn Schofield. He cost Kepitis’ Woppitt Bloodstock $210,000 at the 2016 Magic Millions Gold Coast Yearling Sale – purchased from the Newhaven Park draft. A good looking son of two time Cox Plate winner So You Think, Higher Ground is the first named foal for his dam, the twice Perth winning Encosta de Lago mare Dark Vision. Dark Vision in turn is from a stakes performed sister to Imposingly (dam of Bonneval and National Broodmare Sale bound Imposing Lass) and three quarter sister to Group One winners St Reims and Champagne. 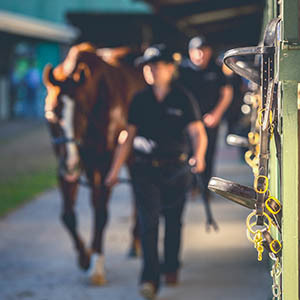 The three stakes races kicking away the Brisbane Carnival were swept by Magic Millions graduates – two Gold Coast Yearling Sale buys and a graduate of the Gold Coast March Yearling Sale. Classy three-year-old Whypeeo couldn’t have been more impressive in his demolition of his rivals in the listed Mick Dittman Plate (1050m) at Doomben. On the speed throughout, Whypeeo never gave his rivals a look in, cruising to the line under Jeff Lloyd to win by four lengths. The son of I Am Invincible was purchased by Blue Sky Thoroughbreds from Yarraman Park Stud for $200,000 at the 2016 Magic Millions Gold Coast Yearling Sale. The youngster has always shown huge ability since being unearthed by trainer Toby Edmonds. Over the most recent Summer Carnival Whypeeo won the listed Gold Edition Plate before running a gallant fourth in the $2 million Gold Coast Magic Millions 3YO Guineas (1400m). Whypeeo is one of two stakes winners produced by the Fasliyev mare Sunset Boulevard – a 100 per cent winner producer. Her other is the Group Two Angus Armanasco Stakes winner Meliora. In His Stride gave connections plenty to cheer about when he scored an easy win in today’s listed Ascot Handicap (1200m) at Doomben. Prepared by Rex Lipp and with James Orman in the saddle, In His Stride proved much too good, beating home the early leader Hi I’m Back by a length and a quarter. 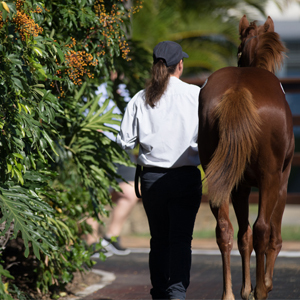 A graduate of the Eureka Stud draft at the 2016 Magic Millions Gold Coast March Yearling Sale, In His Stride is a son of Queensland Guineas winner Rothesay and from a twice raced daughter of Sequalo. His dam In Her Shoes is a three quarter sister to the Group One QTC Sires’ Produce Stakes winner Star Shiraz. 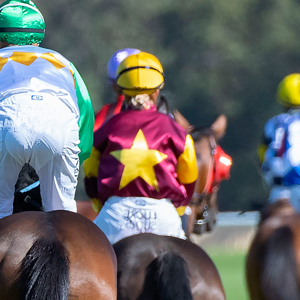 The consistent Toowoomba trained gelding is now the winner of five races and with a string of excellent efforts in feature races he’s earned his connections over $620,000. Talented mare With a Promise notched an eighth career win and second stakes success a short time later when she proved too strong in the listed Tails Stakes (1600m) at Doomben. A daughter of Yarraman Park Stud’s super sire I Am Invincible, With a Promise went to the line under the urgings of Bobby El-Issa to beat Mr Epic by a head. 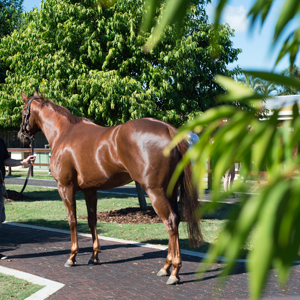 A $26,000 buy for Boomer Bloodstock from Corumbene Stud at the 2015 Magic Millions Gold Coast Yearling Sale, With a Promise has now won almost $300,000. With a Promise is from the Sydney winning Hurricane Sky mare Danrese, a half sister to Adelaide stakes winner Vignor and the group placed Domielle. Quality three-year-old Despatch emerged as one of the youngsters to follow at the Adelaide Carnival when he scored a brilliant win in the listed Redelva Stakes (1100m) at Morphettville. Prepared by Tony McEvoy the former Magic Millions Ballarat 2YO Clockwise Classic winner was able to notch his maiden black type success at just his fifth time of asking. The son of Written Tycoon was purchased by McEvoy Mitchell Racing for $195,000 at the 2016 Adelaide Yearling Sale from the draft of Baramul Stud. 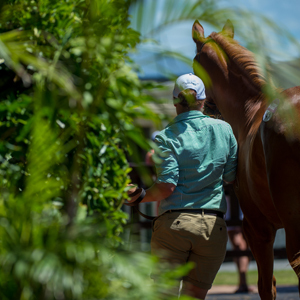 He was a successful pin hook for Baramul’s Paul and Amanda Thompson who paid $40,000 for him at the 2015 National Weanling Sale when plucked from the Woodside Park Stud draft. Despatch, the 24th individual stakes winner for former Magic Millions graduate and now leading Victorian sire Written Tycoon, is from a Sydney winning daughter of Fasliyev. His third dam was a Group One winner in Argentina. Later in the afternoon Perth sprinting mare Dainty Tess emerged as a leading player in the Group One Robert Sangster Stakes with a sweeping win in the Group Three Irwin Stakes (1100m) at Morphettville. A Queenslea Park Thoroughbreds graduate from the 2015 Magic Millions Perth Yearling Sale, Dainty Tess was already a Group Three winner in Perth but today’s win was by far her best. In winning the War Chant mare had to beat home Group One winners and eventual second and third placegetters Viddora and Secret Agenda. Dainty Tess is now the winner of 12 races and her earnings have passed $900,000. Prepared by Scenic Blast and Scenic Shot’s trainer Danny Morton, Dainty Tess is one of three winners produced by the Perth two-year-old winner Classic Smile, a half sister to stakes performer Claise Brook. Progressive Perth filly Mizlecki made it back to back stakes wins when she led home a stable quinella in the listed Sheila Gwynne Classic (1400m) at Ascot. Prepared by master horseman Fred Kersley, Mizlecki finished full of running under Jerry Noske to beat Necklet by a widening length and a half margin. The filly by Lope de Vega is a Yarradale Stud graduate of the 2016 Magic Millions Perth Yearling Sale and is now raced by Kersley’s wife Judith. Mizlecki is from an Al Maher half sister to the stakes placed Purrpurrlena (dam of G1 winner Entisaar) and is from the same family of last week’s Karrakatta Plate runner-up Lady Cosmology. Across the ditch earlier in the afternoon the Lope de Vega filly Rubira scored an impressive win in the listed Champagne Stakes (1600m) at Pukekohe. Ridden just off the speed, Rubira came with a strong finish between runners under Danielle Johnson to win by a length in an impressive performance. Rubira was purchased by Andrew Forsman for $36,000 at last year’s Magic Millions National Yearling Sale from the draft of Attunga Stud. Forsman co-trains Rubira with legendary New Zealand horseman Murray Baker. A stakes winner from just three starts, Rubira is from the Sydney placed Ad Valorem mare Duty Bound and hails from the family of international Group One winners Noordhoek Flyer, Cherokee Rose and Kirklees.